In early 2014, I was first introduced to this cute little store in downtown Sykesville called "A La Mode Boutique". If you’ve never been into the boutique, please go check it out. It is adorable. I actually have to pull myself out of there most days because I fall in love with everything! And even more than the store, the owners Chris and Amie McCaslin, well they are just something special. These two are some the sweetest people you will ever meet and are raising an adorable family. As I watch them grow their business, continually give back in the community, and raise their children – it is a true testament to me of what it means to Go Out and Be Great. A La Mode had donated to baskets and gift cards to the foundation but in 2014 they came to us and they wanted to do more. So by March of 2014 the store began carrying our Go Out Be Great gear in their shop! The store donates back 100% of our gear sales! From the goodness of their hearts, they give back to the community by supporting The Nathan Chris Baker Foundation. It is amazing to see how the foundation can spread by awareness with every customer who walks through those doors. 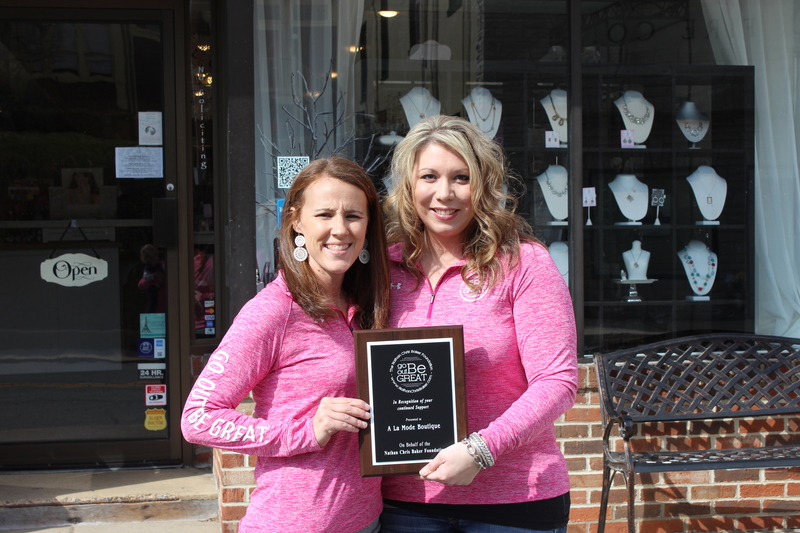 In 2015, A La mode sold $4, 200 in Go Out Be Great merchandise just from their Main Street Sykesville store alone! Now A La Mode has a Main Street Ellicott City location as well and both stores are carrying our gear! How cool is that? Each shirt that is bought in A La Mode, on our website, or at an event not only raises money for our mission but it also inspires people to Go Out and Be Great and raises awareness every time the shirt is worn! Today I was honored to present Amie McCaslin a plaque from The Nathan Chris Baker Foundation to say thank you for all the wonderful work they do. Though words will never adequately express how grateful we are for A La Mode and their support we still want to say… Thank you A La Mode!